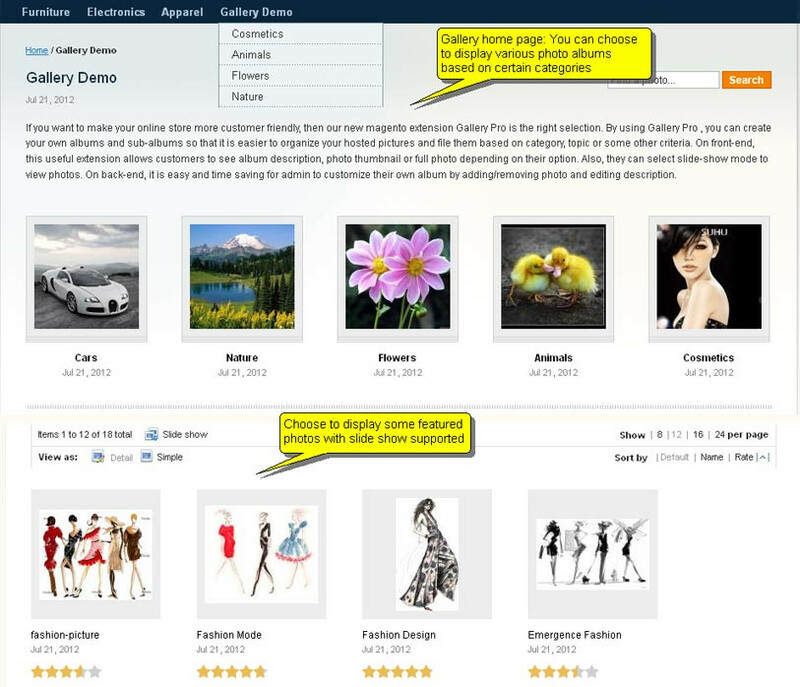 Link photos to a product or other page on your website. 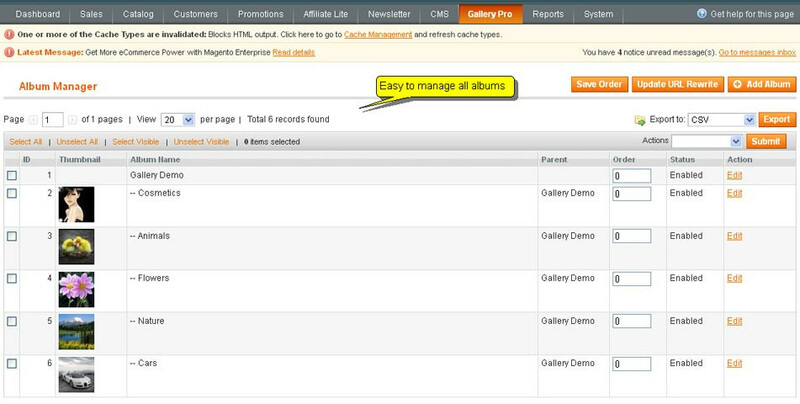 * Fix bug "show all albums (not distinguish store-views) on top menu"
+ Fixed some display problem. 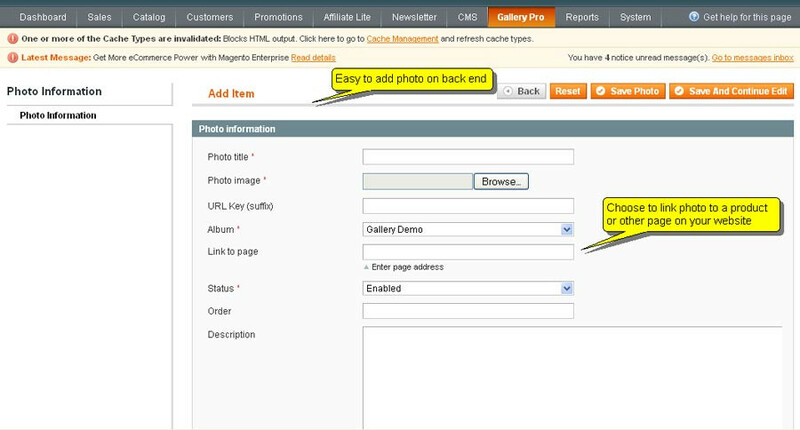 + Fixed bug when upload image in frontend, image not found if uploaded image have space in name (Magento Professional Edition and Enterprise Edition only). * Fixed bug when upload many photos, only accept lowercase file extension. * Fixed image not found when upload image with space or non-alphanumeric in name. 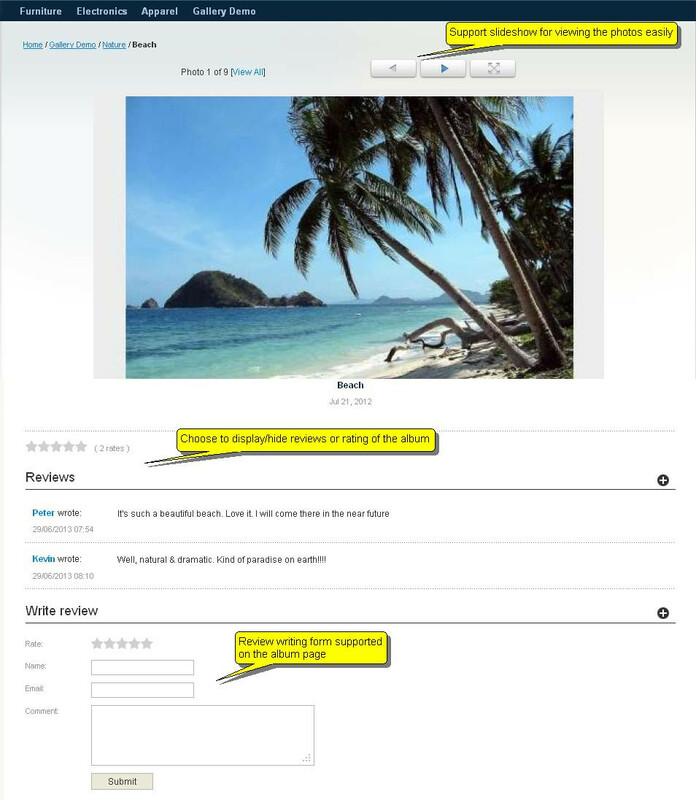 * Fixed when upload image in frontend, replaced existed image (right behavior must be rename uploaded image). 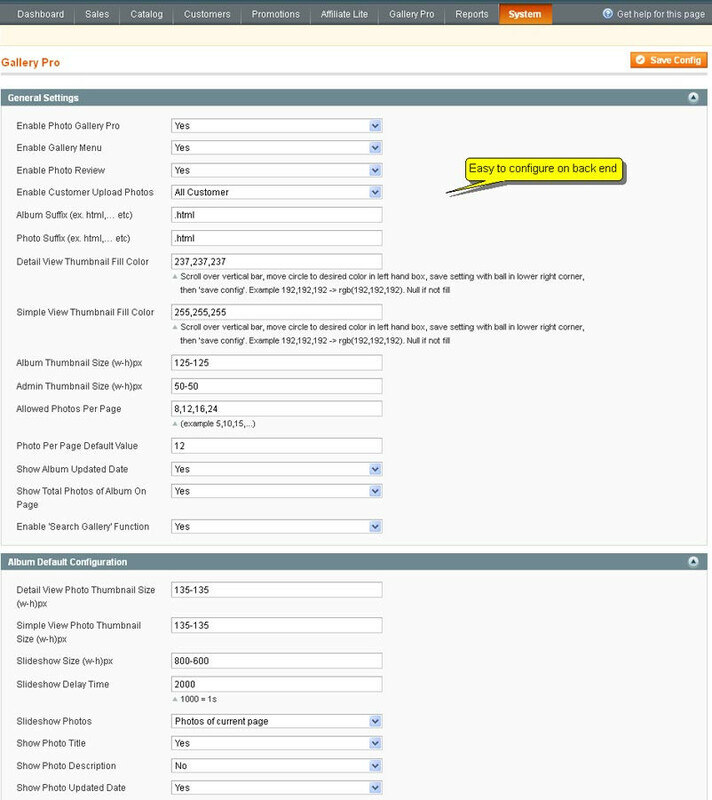 + Change when upload image in frontend, upload image in specific folder depend on category. 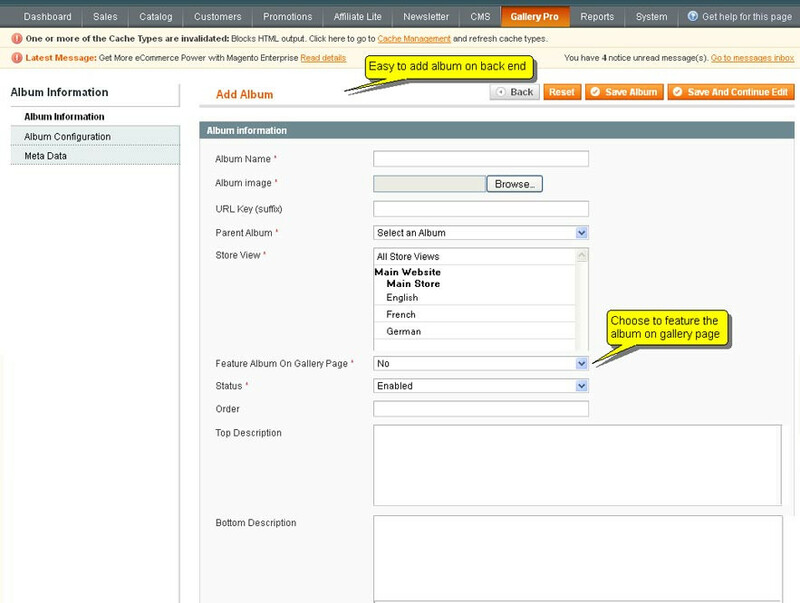 + When upload many photos, allow input base filename. 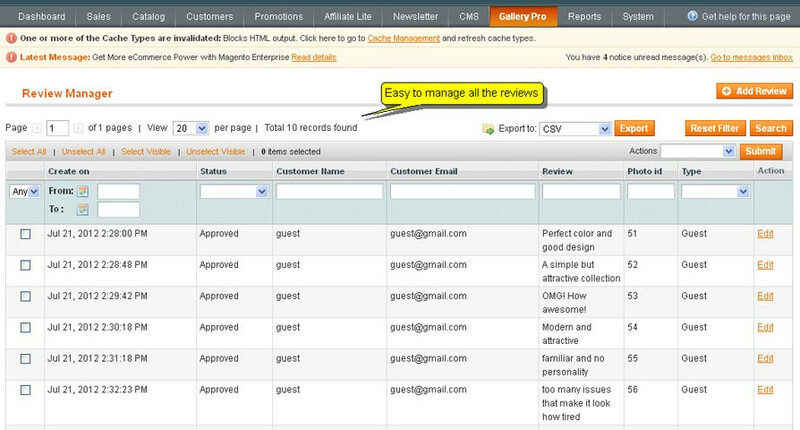 + Upgrade for Magento Professional Edition and Enterprise Edition. 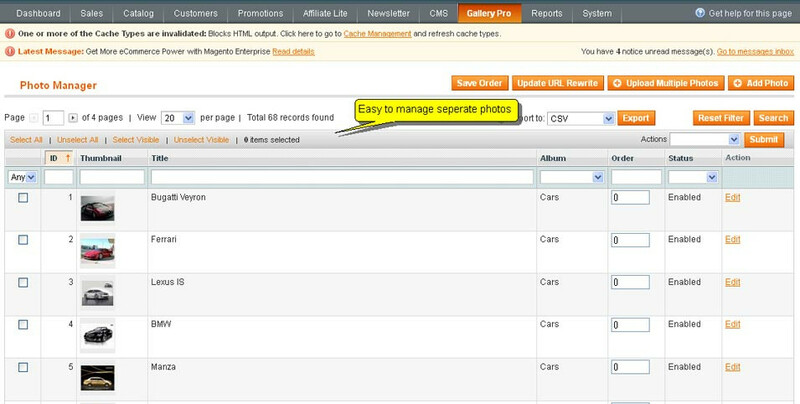 + Add <add many photos> feature , use image archive. This extension is as good as it looks, faced some trouble while installing it, but the support team did a good job and finished it for me, I'me glad to have this extension and glad of their support team. The extension is easy to use and install. Simple and clean. Great support and well written code. Like other reviewers, I had minor issues when installing the extension. I don't know what it was, but the customer support fixed everything very quick. They've been great through install and setup of the module! Very satisfied! I purchased the Gallery Pro extension from mage-world.com and got some of the best support ever. I had previous gallery extensions installed (the free ones available) and wanted something more professional. The previews look promising and I was almost discouraged by a negative review on Magento Connect. After looking at reviews from other extensions and seeing the website and demos, I decided to give it shot anyways since I really like the extension. Upon installation, the extension would not world because I had an old db with conflicting names from previous installs. I got an error message and was stumped. I removed the install files and proceeded to send them an email. I looked around the website and actually saw they have live chat support. The person who answered promptly was very knowledgeable and extremely helpful. They saw the problem and immediately offered to help fix it. I created some temporary logins to my site backend and they did all the work. After the db issued was solved, then came the navigation bar as I do have custom template for my website. The install script apparently adds a Gallery link to the nav bar, but I had some custom links in my top.phtml and that was all missing and mis-aligned. They went back in and got that working in a few minutes as well. Overall, I am super please with the support. I was working on the site at 2-3AM to have minimal interruption to my customers and mage-world being in vietnam was actually a plus since it was still daytime for them. Very efficient and good support when I had some problems with the installation due to my ftp software that didnt work properly and skipped files. I also encountered a bug related to Swedish special characters but the mage-world team corrected the problem within an hour and even updated the installation for me..
Great attention and great support! I would really like to rekommend these guys! This is an extension I have been waiting for so long. Works really great - and the support by Mage-World is excellent. Absolutely recommendable!